The graph on the left is, in a way, the poster child for all that is wrong with the structured products industry. Julius Baer are using it in their promotional materials to sell Diskontzertifikate or discount certificates. These products are extremely popular in Germany and Switzerland. Their name suggests that they represent a bargain: the opportunity to buy a share for less than the market price. But, of course, if one looks a bit more closely, there is a simple reason for the “discount”. Buying the certificate is equivalent to buying the underlying stock while selling a call option on that same stock. Naturally, this reduces or eliminates the upside on the stock position, i.e., should the stock price go up, the owner of the certificate would participate only to a limited extent, if at all. There is obviously no bargain. Actually, a discount certificate offers the same payoff as cash plus a short position in a put option on the stock. Puts are typically bought by investors who want to “insure” their stock position against a loss in case of dropping prices. Selling a put is therefore equivalent to selling insurance. I wonder if the typical buyer of a discount certificate (or its exotic cousin, a reverse convertible with barriers) is aware of the true nature of the instrument? The banks that sell these products are highly creative – amply illustrated by the choice of the name “discount certificate” – in obscuring the true risks of these products. Julius Baer’s graph is a classic example of this creativity. When we look closely at the graph, we note that the axes are labelled but there is no indication of scale. 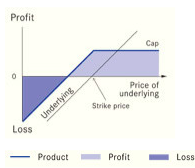 The graph gives the impression that the maximum potential loss is only insignificantly bigger than the gain to be had if the stock does not drop. As a result, the graph suggests a highly favorable asymmetrical risk structure with a very high probability of a gain and a small probability of a similar sized loss. The reality is, of course, quite different. The ratio of maximum loss to maximum gain on this type of instrument is typically closer to ten than it is to one. If one were interested in transparent information, the vertical axis would need to be placed much further left than it is. Naturally, I am not suggesting that Julius Baer is doing anything illegal. They have used this graph for a very long time and it has undoubtedly been approved by their legal department. But a bad taste remains. There is the impression that less sophisticated investors are invited to misunderstand the true nature of the product and the risks associated with it. This is perhaps only a particularly noticeable example of the lack of transparency in the lightly regulated structured product industry in Switzerland and Germany. It sometimes seems to an outside observer that innovation in structured products is driven mainly by the desire to maximize the opportunities for hiding fees and giving the illusion of offering value. But that is a topic for another day.